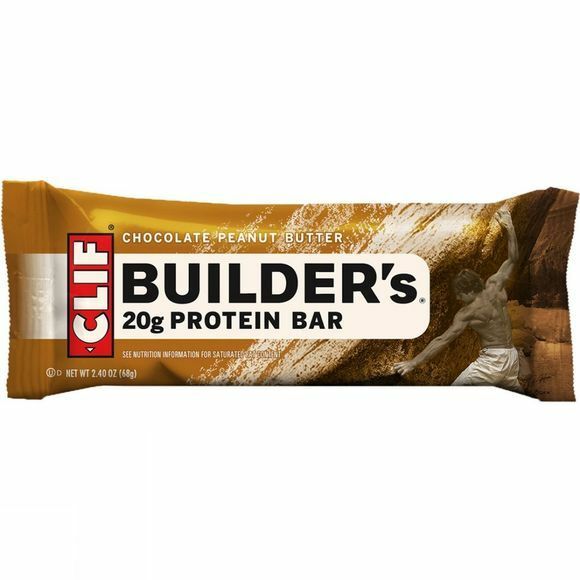 Clif's Peanut Protein Builder's Bar is fantastic for helping growth and maintenance of muscle mass. Builder's never contain partially hydrogenated oils, sugar alcohols or other nasties, so you can put everything into your workout knowing that you'll get everything out of it. Soy protein isolate, beet juice concentrate, brown rice syrup, dried can syrup, palm kernel oil, peanuts (6%), cocoa (3.3%), rolled oats, humectant: vegetable glycerin, soy protein, concentrate, natural flavourings, peanut flour (1.2%), rice starch, sunflower oil, inulin (chicory extract), sea salt, oat fiber, emulsifier: soy lecithin, vanilla extract, cocoa butter (0.5%), vanilla extract, antioxidant: tocopherol rich extract (soy). Vitamins and minerals: Calcium carbonate, magnesium oxide, ascorbic acid (Vit. C), DL-alpha tocopheryl acetate (Vit E), thiamine hydrochloride (Vit B6), ergocalciferol (Vit D2), cyanocobalamin (Vit B12), potassium iodide. Contains peanuts, oats and soy. May contain traces of barley, rye, triticale, wheat, milk and nuts.